We only have two left!!! With the participation of 16 Maine alpaca farms, the Maine Alpaca Blanket Project collected, sorted, and graded hundreds of pounds of fiber to put towards the manufacturing of this limited edition luxury couch throw. All the blankets produced in this project were made with the fines grades of 100% Maine-grown alpaca fiber and then beautifully woven at the Maine Woolen Mill in Brunswick. 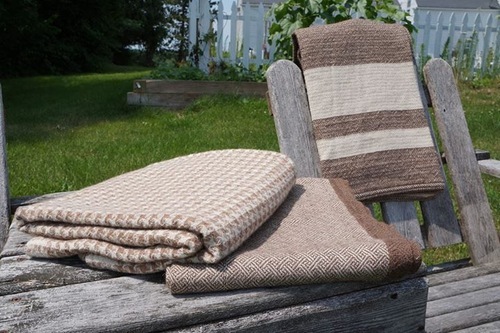 With your purchase of this blanket, you become part of a growing community that supports Maine's hard-working fiber farmers and cottage textile industry. This blanket is an excellent example of the many fine products being made with Maine Alpaca fiber. The natural beauty of the fiber gives you exceptional warmth and softness that you can feel at the very first touch. We are sure that you will enjoy the superb comfort of this blanket for a long time. Throw comes in its own clear plastic zippered bag.